According to the National Women’s Health Resource Center, one in five women suffer from menorrhagia, or heavy menstrual bleeding. For many of these women, this heavy bleeding once a month can require them to put their lives essentially on hold until their menstrual period is over. While there can be a number of different causes for heavy menstrual bleeding, research has shown that vitamin E can help to reduce the amount of blood loss as well as pain associated with your menstrual period. According to the National Institutes of Health, vitamin E is an antioxidant that helps your body protect against damage caused by free radicals that can affect the cells, tissues and organs. Vitamin E is essential in the formation of red blood cells. The Institute of Medicine’s Food and Nutrition Board recommends adults receive 15mg/day of vitamin E, which can be found in vegetable oils, nuts, seeds, green leafy vegetables and fortified cereals and juices. Heavy menstrual bleeding, or menorrhagia, can cause a significant increase in the amount of blood lost during a period. According to the National Women’s Health Resource Center, the average woman experiences a blood loss of about five tablespoons. If you suffer heavy menstrual bleeding, you may lose as much as 10 to 25 times that amount. Heavy menstrual bleeding can be caused for a variety of reasons, including hormonal imbalances, abnormalities in the uterus, thyroid conditions, blood-clotting disorders or complications from the use of an intrauterine device, or IUD. With many women suffering from heavy menstrual bleeding, many studies have been done to look for possible relief from the disorder, and many of these studies have turned to vitamin E. A 1983 study published in the “International Journal of Fertility” looked at the effects of vitamin E supplementation for women experiencing heavy menstrual bleeding due to an IUD. Patients were put on either 100mg/day of vitamin E or a placebo. 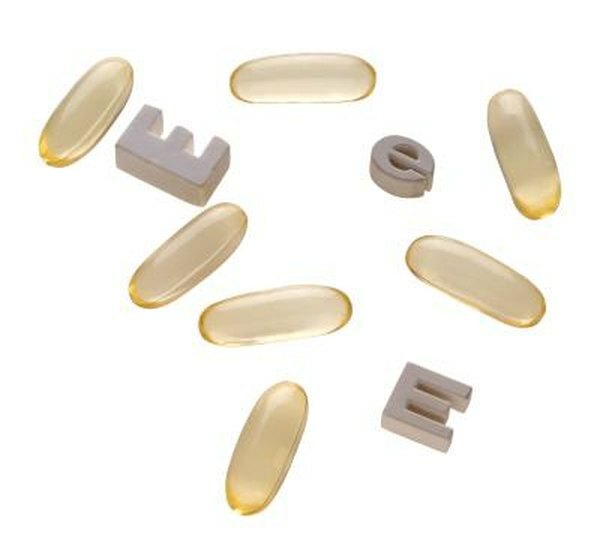 The patients receiving vitamin E supplementation saw their menstrual bleeding return to a normal flow while patients on the placebo saw no change. While vitamin E is generally safe when consumed as part of a regular diet, supplements must be taken with caution as too much can cause severe bleeding issues, including hemorrhagic stroke, or bleeding in the brain. If you suffer heavy menstrual bleeding, consult with your physician about the possible addition of vitamin E supplements and how much you should be taking. It is important to have your physician perform a thorough exam to make sure your heavy bleeding is not caused by any other medical condition. If you are a patient who also takes medications like Coumadin to thin your blood, vitamin E supplementation can also increase your risk for bruising and bleeding and should be discussed with your physician.